Not only does our firm defend Marijuana cases, including Possession, Distribution and Cultivation, we actively support all efforts for legalization. In regard to living life at your best, and to the fullest, nothing beats having a fit body, a fit soul, and, I would add, a clear mind. I start this page with this statement, because it should be clear and understood to all, that I do not advocate the use of drugs of any kind, whether it is Alcohol, prescription drugs or non-prescription drugs, to try to achieve satisfaction or happiness in life. I also do not advocate breaking the law, regardless of how insane the laws may seem. With that said, laws are sometimes just plain wrong. Remember prohibition? The 18th amendment? As to the laws regarding Marijuana, if you believe that these laws are unfounded in reasoning, a violation of your personal rights, completely draconian in both application and penalties, or just plain wrong, then it is up to you, as it is to all of us, to take a stand, make yourself heard and do whatever you can to see the laws changed. While I not only advocate that happiness is best derived from fulfilling activities, spiritual growth, physical fitness and relationships with family, friends and community, Marijuana just like Alcohol, if used in moderation, can be used without harm, and without interfering in other areas of life. According to the findings of a huge amount of current research, the use of Marijuana may even be healthy for the body. Among other things, Cannabis (Marijuana) has been successfully used for pain relief, and for the treatment of cancer. These are just a couple of recent findings. For a more comprehensive list of the Medical and/or possible Health benefits see the link to Medical Marijuana below. In regard to the use of Cannabis, it is my own view, that there should be no reason that any citizen of the United States, or anywhere else in the world, should not be able to make a personal choice. Personal choice requires legalization, and a society and a government that respects the individual rights and liberties of its citizens. We have been taught to think of ourselves and our country as the Great Free World, or The Land of the Free, yet other countries and societies have sometimes shown far more tolerance and respect for the freedom of their citizens. In this regard, one only need look at the Netherlands. The coffee shops which have existed all over Amsterdam, for many years, prove that a respect for Individual Rights WORKS, not just for the individual, but also for society. Also, people are finally learning that Marijuana has existed and been used for thousands of years by various peoples all the world over. If you thought that (Marijuana) was something discovered in the sixties, think again. During a recent Archaeological find in China, in the Gobi desert (as reported in CNN International edition 2-14-2009), Archaeologists found approximately 2 pounds of what they described as very potent Cannabis, stashed within a Gushi Shaman’s tomb. Dating of the find is to a time approximately 2700 years ago. Perhaps it was a time of more freedom in the area we now call China, before it later became a country controlled by a communist regime, which it remains today. In the United States, we have a great country. It’s just that our current leaders have lost sight of the ideals (meaning Individual Rights and Liberties), that formed the fundamental building blocks, or the very foundation, upon which our Great Country was built. However, even for the founding fathers, as the saying goes, Freedom Is Never Free. That’s why the foundation of this country required a revolution. Therefore, if you believe in something, then do your part, and at least make yourself heard. THE CASE FOR LEGALIZATION of Marijuana, including possession, cultivation and sales, goes to the very heart of the absolute insanity of the government’s war on drugs. First, let’s recall the country that we live in, and the most basic desires for Freedom and Liberty that our Founding fathers believed in and desired so strongly, that it prompted the American revolution that created this great country, the country that we know of as the United States of America. Without their beliefs, and their sacrifice, we would not have the Freedoms, Liberties, Rights and Protections that our ancestors, our military forces, and many of our fellow citizens, have given their blood for, so that the rest of us have, and should continue to have, the right to make choices for ourselves, to be individuals, to live our lives in harmony with others, but also to live, and believe, … and THINK, as each of us deems appropriate. THE GOVERNMENT: MAKING SOMETHING ILLEGAL. In regard to Marijuana, a combination of un-founded fears (remember the movie, Reefer Madness? ), and a total lack of respect (to put it mildly), for individual rights by the misguided leaders of our country at the time, as well as money, and the political interests swayed by money, resulted in making Marijuana illegal. One might reasonably wonder what the government’s excuse is for continuing to keep Marijuana illegal today? I would suggest that the lack of respect by our government, meaning our representatives in government, for our individual rights and liberties, not only still exists, but has actually gotten worse. Many in government seem to have forgotten that the Constitution of the United States, and the Bill of Rights, is still supposed to be The Supreme Law of the land. One only need watch the evening News, to see how our Rights are being trampled. The Fourth Amendment is seriously under attack. The government is listening to our phone calls, monitoring the contents of our texts, recording every number that a person calls or receives, has access to every internet search you have ever made, and even your messaging on Facebook. With our Cell phones, our locations are even being tracked, often without a warrant, and certainly without prior notice, just because the government can. Our government is using our wonderful Smart phones, as if it had a right to turn them into Ankle bracelets, again, often without a warrant, without probable cause, and without any prior offense ever having been committed. Even the First Amendment has been under attack. Both indivuals and groups have been “targeted” by the full force of the government, just because they have expressed disagreement with the policies of our current leaders. This should be of serious concern to every citizen. Our Rights, Freedoms, Liberties and even Privacy, were hard won; but they can be very easily lost if we do not remain both vigilent and active to protect them. Misguided fears regarding Marijuana are also still on the horizon. However, I would also argue that there are other reasons which many people have never considered to be factors. Consider MONEY for one, and JOBS, (Government Jobs) for the other. Keeping Marijuana illegal has literally created tens of thousands of Law enforcement jobs. To get an idea of the amount of money involved in the war on drugs, take a look at the Drug War Clock link located at the end of this page. While this link depicts the money spent fighting the Governments War on all Drugs, a huge percentage is being used by the Government to still wage its war against Marijuana. Who pays the bill? The tax payer does, and as with so many things, by virtue of the perpetual government money printing press, the tax payers are made to do it on credit. One of the results is the ever increasing budget deficit. One could probably make a reasonable argument that if Marijuana was legalized across the country under all the State laws, and also under Federal law, that it would probably put a lot of Federal and State employees out of work. One must ask, however, whether the possible loss of jobs is a legitimate reason to keep something illegal. I would argue that it is definitely not; and that to continue to wage this war of Prohibiton, that has so many adverse effects upon the people, just to maintain law enforcement jobs, is morally wrong. While I have respect for our City, State and Federal employees, some of which do very necessary work, I believe that this has certainly been a factor in the attitude of the various Law enforcement agencies to continue their otherwise illogical opposition to legalization. Ending the enforcement and prosecution of BAD laws would not only save our country billions of tax payer dollars; but it would also put an end to ruining the lives of otherwise good people for exercising Liberties and Freedoms that our government never had the right to take from the people in the beginning. The 18th Amendment, Prohibition of Alcohol: What did it accomplish? Crime! The illegality created the crime, and it is that simple. It created the Mobs, the Al Capones, the underground black market, etc. When Alcohol was made legal again, and Prohibition ended with the 21st Amendment, the problems caused by Prohibition also ended. In another light or perspective, perhaps we should consider the equality and the right to exist, of not only other human beings, but also all other living things on this planet. Common sense should tell us that no one, and no government, should have the right to make it illegal for anything that grows naturally on this earth, and has existed longer than mankind itself, to be illegal to possess, to grow, allow to grow, or to even exist! What right do we have to legislate the very existence of any other life form, plant, animal or other? In regard to Ending the Prohibiton of Alcohol, which started with the 18th amendment, it was later repealed by the 21st amendment. It only happened, thanks to the citizens of our country, (which means your grandmothers and grandfathers, or great), that were willing to take a stand AND DEMAND A CHANGE IN THE LAW. IT IS TIME FOR WE, THE PEOPLE, TO DO THIS AGAIN. I believe that if we had wanted a government that acted in such a way, then perhaps none of us would mind living under the rules, censorship, lack of privacy, lack of due process, etc., et. al., of a country like Communist China. We are closer to that reality than you, the reader, may think. Fortunately, the 13th amendment abolished slavery. The 21st amendment abolished prohibition. This is truly something to think about. The 21st amendment was only made possible by the demands, protests and actions, of our grandmothers and grandfathers, or great grandparents. If it was not for them, you, the reader, would most likely still be subject to Criminal prosecution and even incarceration, just for having a beer or a glass of wine. IT IS TIME FOR CHANGE ONCE AGAIN! THE CONSTITUTION OF THE UNITED STATES: is the Supreme law of of the land. All those in political office and in the military, have sworn to uphold the Constitution, as have most citizens of the our great country. Therefore, we must ask: What have we, as citizens, and public officials, allowed to happen? Not everyone is afraid to speak out, or stand up for what they believe in, or for that matter to actually support the Constitution of the United States, the supreme law and statement of our rights and liberty that we have all sworn to uphold. This was a 1972 case, when the United States Constitution had the respect that it was due. `The sole end for which mankind are warranted, individually or collectively, in interfering with the liberty of action of any of these number, is self-protection. That the only purpose for which power can be rightfully exercised over any member of a civilized community, against his will, is to prevent harm to others. His own good, either physical or moral is not a sufficient warrant.’ J.S. Mill, On Liberty, Chapter 1. See also the Judge’s same reasoning in PEOPLE VS. ERIC LORENTZEN, 387 Michigan Reports, page 167, where Justice Kavanagh voted to strike down the laws regarding the sale of drugs. “The right to possess and use something, however, has little meaning unless one also has the right to acquire it, and hence proscription of sale cannot be reconciled with a right to possess and use. THE FOLLOWING IS A SHORT LIST OF INDIVIDUALS, LAW MAKERS, LEGISLATORS AND AGENCIES THAT NEED TO HEAR YOUR OPINION. DON’T SEND AN EMAIL, WHICH MOST LIKELY WILL ONLY BE DELETED OUT OF THE INBOX. WRITE A LETTER AND USE A STAMP. 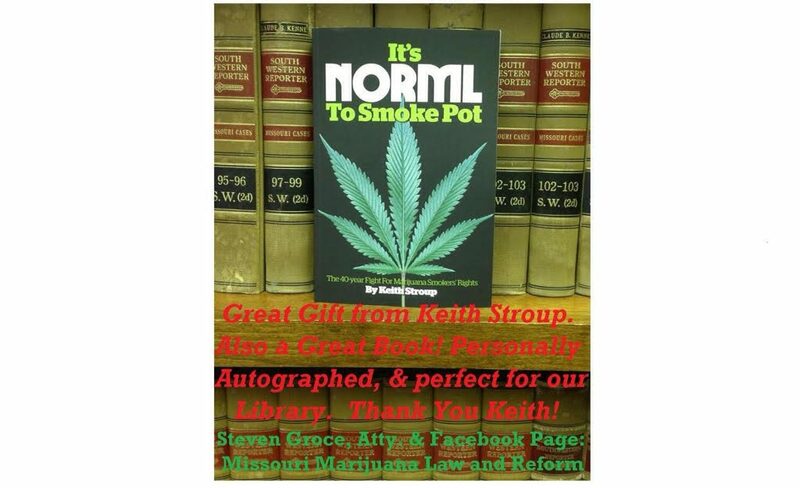 MISSOURI MARIJUANA LAW AND REFORM, Facebook Community Page, Read and Post your own thoughts. Community Page sponsored by Attorney Steven F. Groce.